Polished jasper pebble, about one inch (2.5 centimeters) in length. Jasper is an opaque, impure variety of quartz, usually red, yellow, or brown in color. This mineral breaks with a smooth surface and can be highly polished. It is used for ornamentation, such as for vases, or as a gemstone. It has been used to make seals and snuff boxes. When the colors are in stripes or bands, it is called striped or banded jasper. Jaspilite is a banded iron formation rock that often has distinctive bands of jasper. The Egyptian pebble is a brownish-yellow jasper. Unpolished jasper, freshly recovered from the ground. The name jasper means "spotted stone." It is derived from the Anglo-French jaspre, from Old French jaspe, from Latin iaspidem (the accusative of iaspis), from Greek iaspis, via a Semitic language (cf. Hebrew yashepheh, Akkadian yashupu), ultimately from Persian yashp. 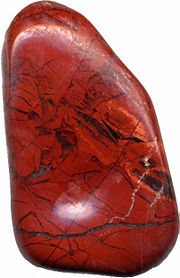 Jasper can appear as an opaque rock of shades of red due to mineral impurities. Patterns can arise from the formation process and from flow patterns in the sediment or volcanic ash that was saturated with silica to form jasper, yielding bands or swirls in the rock. Jasper may be permeated by dendritic minerals, providing the appearance of vegetative growths. The jasper may have been fractured and/or distorted after formation, later rebonding into discontinuous patterns or filling with another material. Heat or environmental factors may have created surface rinds (such as varnish) or interior stresses leading to fracturing. Picture jaspers simultaneously exhibit several of these variations (such as banding, flow patterns, dendrites, or color variations), resulting in what appear to be scenes or images in a cut section (as in Biggs, Deschutes, Owyhee, Poppy, and other named types). Spherical flow patterns produce a distinctive orbicular appearance (porcelain jaspers such as Blue Mountain, Bruneau and Willow Creek). Complex mixes of impurities produce wild color variations (as in McDermit jasper). Healed fractures produce brecciated jasper (such as Canyon Creek). Examples of this can be seen at Llanddwyn Island. According to Rebbenu Bachya, the word Yasfeh in the verse Exodus 28:20 means jasper and was the stone on the Ephod representing the tribe of Benjamin. It is described in the Book of Revelation (21:11) as: "It shown with the glory of God, and its brilliance was like that of a very precious jewel, like a jasper, clear as crystal. In the Chinese Zodiac, jasper is the gemstone of the Rooster. This page was last modified on 3 April 2018, at 13:56.